The Twin in Berlin: I Have Spent A Year As "Sister Mittleman" What A Life! I Have Spent A Year As "Sister Mittleman" What A Life! I HOPE YOU ATE ICE CREAM. I did. And I spent like 7€....WORTH IT. On 28 August, Friday I reached my year mark as a missionary! I have spent a year as "Sister Mittleman" What a life! Sister Reed and I got ice cream that only looks like spaghetti momma!!! it was sooooo gooood. I’ll send pics. We have interviews with President on Tuesday night, at around 20 40 woohooo!!! We shall see if it's in German or not. The primary program was yesterday and it was SO CUTE. The kids were many and they sang so well. Of course there were those who got shy and cried then those who couldn't stay away from the mic. I loved it!! Such a sweet spirit in the chapel, indeed. Now to the good stuff!! In reflecting I have tried to think about what I have "learned" since being on my mission. It is hard to narrow everything down. Soooo many different experiences and emotions have been apart of my missionary life. I think most importantly I have strengthened my testimony of the Savior Jesus Christ, and His work here on Earth. I often say how much I love it here, but as you know it isn't all perfect. It is hard! A mission is not just some glamorous trip, it's a serious and sacred calling. This is the work of salvation we are talking about! The real deal. There have been times when I have asked myself, "But how? How can I survive all of this? It's too exhausting." But I keep going and working along. There is indeed opposition in all things. I have really felt my love for the Gospel grow. I have strengthened my testimony of the plan of salvation. I have become very aware of how precious this message is. It would be way cool to sit inside all day and read the scriptures and rejoice in how great God is all by myself. But God has not just sent us here to help ourselves. We have the precious opportunity to help others as well. DO WE EVEN KNOW WHAT WE HAVE? I have realized how much God believes in us! He trusts a 20 year old young lady to approach people in the street or at their door and in broken (jk let's be real) PRETTY DECENT German try to talk to them about their family or Jesus Christ. And that's pretty wild! But that is what He has asked of me, so I will do it. I know that He uses me, the weak and simple, to accomplish the great. Even when it seems that what I am doing is small or trivial, I know that it has worth. That is something else I have learned on the mission, everything, EVERYTHING good that we do is building up the kingdom of God. It does not come just with teaching or baptizing. But in ALL of our efforts. 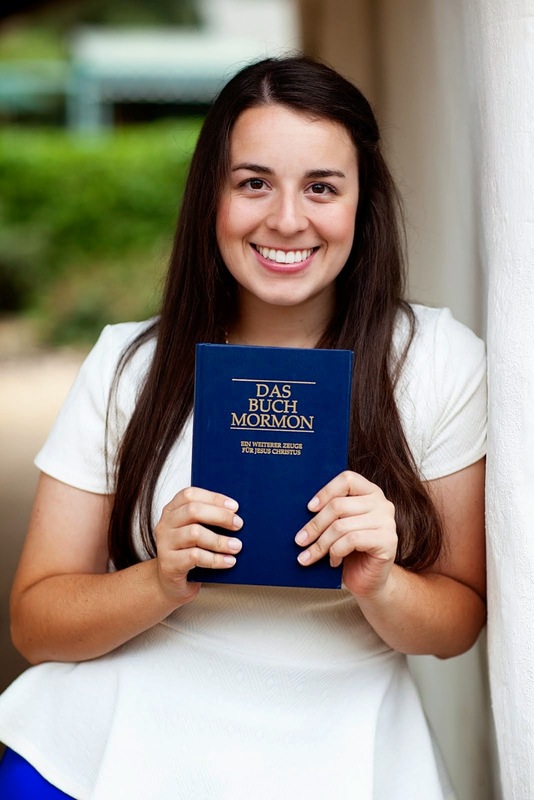 There may be missionaries in south America who are baptizing oodles of people every week, and there may be missionaries in Germany struggling to have decent if spiritual conversations with those they meet every day. Christ completed the Atonement for us, but that is not the only record we have of His time on the Earth. He performed miracles, and He served in soooo many ways possible. Just because playing with children was not suffering in the garden, does not mean it is of no worth at all. Christ taught us to go about doing good, to help and uplift others. We are to be example "in word and in deed of the divinity of His great and marvelous latter day work!" Not juuuuust baptize. Were that the case then I might have gone home awhile ago ;) He has asked me to be here, and to represent Him; I will do what He wants me to do! Whether it be baptize everyone in Germany or even just smile at everyone in Germany. Even if I want to baptize the whole country, I will do what HE wants done. We must be ready and willing for it all. Whatever the assignment may be, it comes from Him, and therefore it is important! I have experienced so many moments of great joy. And I have cried and felt feelings of hopelessness and despair. Christ loved, and He wept as well. Our experiences may be hard, but the Gospel is simple. I know that God will ALWAYS be there for us. We can literally feel His comfort and love. I know that He loves me. I know that Christ paid the price for my sins, and died and was resurrected so I one day can do the same. I know that the Gospel is not just some nice idea, but that it is the most important message that should and must be taken to the whole world. I can keep going and fight the good fight. When things are hard sometimes I just have to say GET OVER IT. WOOHOO. Bold, I know, but come on!!! The Lord is on my side. I have the rest of eternity to enjoy myself. That's about all I have time for, but those are a few things that were on my mind this week. I have six months left that I hope will go by slower than the past year!!! I love my mission. These experiences and feelings I am having are so special and so important to me. I love Germany, and I love serving those here. Life is good.